The Society of Hospital Medicine’s (SHM’s) Center for Hospital Innovation and Improvement has been using mentors to guide planning and implementation of successful strategies to improve quality care in hospitals throughout the United States. One of these key programs focuses on glycemic control. In the past five years, more than 100 hospitals have participated in the glycemic control quality improvement program. As a result, a large database has been created that allows SHM to benchmark measures of glycemic control, such as mean rates of hypo- and hyperglycemia, so that hospitals can compare their performance to similar institutions across the country. The goal of this paper was to see if the availability of Society of Hospital Medicine (SHM) mentors would assist hospitals in planning and implementing innovative strategies to improve glycemic control. 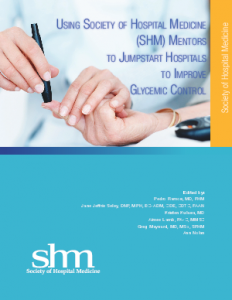 After identifying best practices utilized in high-performing hospitals for inpatient glycemic control, SHM set out to test the practices in new hospitals with established glycemic teams. The paper provides three cases and the results. Click here to view the case study in its entirety. To learn more about the Society of Hospital Medicine’s Glycemic Control programs, contact Ann Nolan at anolan@hospitalmedicine.org or 267-702-2674.